Jorge Cordova is not an ordinary pitching coach. 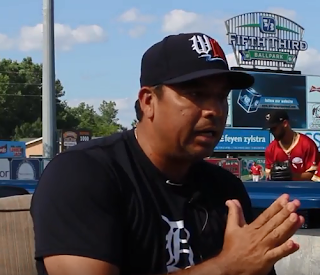 He joined the Detroit Tigers' Single A West Michigan Whitecaps coaching staff in 2017, and by the end of the season the Whitecaps had the best overall starting rotation and bullpen in the Midwest League -- "in the entire minor leagues," he reminds me. Every pitcher on that team that I talked to during the 2017 season spoke very highly of Cordova's influence and impact, so much so that it was clear that I needed to go to the source, to find out what this guy is doing that enables him to have this kind of success. He was quick to give credit to the pitchers themselves for that magical 2017 season: "those guys were so good because they listened so well." But there's more to the story than that, and the answer to the riddle has a lot to do with Cordova's philosophy of coaching. It's a holistic approach, one that involves a sharp eye for good pitching mechanics, statistical evaluation, Statcast data, and yes, even a bit of psychology. "I've learned through the years that, in order to trust in somebody, you have to become a friend," he explains. Players don't respond well to coaches who "make the mistake of acting like we think we know everything," and so Cordova makes sure the prospects under his guidance understand that "I'm here for them, I'm here to be useful, I'm here as a tool for them, and I do everything I can to help them -- not just get to the next league, but to get to the major leagues." It's a fine line between friendship and authority, but he walks that tightrope with confidence. "I explain to them, 'you still have to respect me as a coach'," but he also works hard to communicate to "my kids," as he affectionately refers to them, "I'm here to make you better, I'm here to promote you, and there's no better feeling than when I'm watching TV and I see you guys playing in the big leagues." The pitchers themselves have affirmed that this approach works. They trust their coach, they're comfortable approaching him to seek help when they're struggling, and they listen to what he has to say. Most of the them, anyway. Cordova remembers with some fondness that "Gregory Soto was really tough to talk to and work with" in the beginning. The hard-throwing lefty had (and still has) a big fastball that could reach into the upper 90's, so the talent was there, "but he didn't know how to deal with it after he'd walk a batter." Some of these kids haven't learned how to handle adversity and challenge yet, and that's where Cordova digs in: "there was a lot of hours [with Soto] talking about, 'hey, that's part of life, you have to learn how to deal with it, you don't have to show your frustrations' ... we spent a lot of hours before games, after games, when we'd ride on the bus, have a meal in the restaurant, have a rain delay, talking about that stuff." Cordova isn't just developing mechanically sound pitchers, he's trying to develop well-rounded human beings who are, we should remember, anywhere from 18 to 22 years old. He's teaching sliders and curveballs at the same time he's teaching life lessons to young men who are still in their formative years. "It gives me a good feeling, when I see those guys growing up," he says. "I really judge myself, not only as a baseball coach, but ... I try to help my kids become good citizens, to behave and be professional, how to deal with adversity ... some kids take longer to learn, longer to adjust, some kids learn quickly ... but that's how I judge myself, by how much I impact their lives to be both good citizens, and good ball players." When it comes to developing better pitchers, better ball players, Cordova uses every tool at his disposal. "This is my thirteenth season as a coach, so I pay very close attention when my guys are on the mound, and I really trust my eyes and my experience as a coach," he tells me, but he knows better than to rely solely on the eye test during live game performances. "If I'm not sure about something, I go look at the video, I double-check myself, and then I have them watch the video with me so they can see for themselves what's going on." This approach came into play recently, when Tigers top pitching prospect Matt Manning got rocked by the Peoria Chiefs, giving up seven hits (including a home run), four walks, and five earned runs over just two innings before getting pulled for a reliever. Cordova spotted a slight mechanical flaw in Manning's delivery, corrected it, and watched as Manning rebounded in his next outing: six shutout innings with eight strikeouts. It's not just observation and video that Cordova uses, however, because the Tigers have invested in using Trackman/Statcast technology even at their lowest minor league levels, and Cordova embraces all of it. "This is the 21st century," he says, "you gotta be out in front of the technology, you have to use whatever you have to get the pitchers to the next level." You want to talk about the next-level pitching statistics, such as spin rate? Cordova is happy to oblige. "You might think a guy like Matt Manning has a high spin rate because he throws so hard, but no, he's had below-average spin rate," says Cordova, and he uses that information in bullpen sessions. "I've learned over the years how to use that data, high spin rate, low spin rate -- then I have to find out why a pitcher has [low spin rate] before I go talk to him." And indeed, Manning's below-average spin rate from 2017 is frequently up to average levels -- and sometimes above-average levels -- in the 2018 season. The Cordova Method appears to be working. And then there's the issue of staying in touch with the pitching coaches at the higher levels. Tigers General Manager Al Avila has made it his mission to make sure the organization does a better job than they have in years past at maintaining consistent coaching across all minor league levels. It harms player development if one pitching coach is trying to get a reliever to throw more sliders, only to have the coach at the next level tell him to ditch the slider completely and throw more two-seam fastballs. "I call Mark Jones [the pitching coach at the Advanced A level] if anyone gets promoted to the Lakeland Flying Tigers -- I call him and say, 'Hey, Mark, we worked on this, we hammered that, make sure you talk to him and remind him.'" A recent example comes to mind in the person of starting pitcher Eudis Idrogo, who was just recently promoted to Advanced A: "He just got called up a couple days ago, so I talked to Mark about, 'make sure you hammer Idrogo to stay on top of the ball, because he has a tendency to get underneath the ball as a side-armer' ... we try to get on the same page." It helps that Cordova and Jones are already friends and stay in regular contact. "Usually I can just have a one-time conversation with Mark [when a new pitcher is promoted], but we have a pretty good relationship, so if he feels like he needs to find out something more, he calls me, or we text each other so we know what's going on." Staying in touch. Over-communicating. Taking a hands-on approach, whether it's reading reports, watching videos, collaborating ("sometimes I don't know much about a hitter, but my pitcher was teammates with him in college, or faced him in short-season, so we share that information") ... or just simply talking to his pitchers over a meal at a restaurant. This is how Jorge Cordova establishes trust and earns confidence. It's a full-time job, and Cordova has a regular schedule to make sure he's keeping his fingers on the pulse of his staff: "I do a long bullpen session with our starters two days after they make a start, and then I do a touch-and-feel short session two days later, the night before they start again, so we work on a lot of details. I don't believe in changes, I believe in adjustments." The Whitecaps currently have a league-best staff ERA (2.77), league-best WHIP (1.123), the third most strikeouts-per-nine innings (9.3 K/9), the lowest walk rate (2.6 BB/9), and the lowest home run rate (0.5 HR/9) in the Midwest League. It might only be the second month of his second season with the Tigers' Low A affiliate, but Jorge Cordova is already having a huge impact. The fact that his players so readily (and without prompting) mention his influence on their development probably says all that needs to be said. Oh, and by the way, did I mention that he's the one who taught Joe Jimenez how to throw a slider? Perhaps that's another story for another time.